I'll admit that I've never thought much about what happens to the castoffs I successfully convince resale stores to take off my hands a few times a year. I've always been captivated by the in-store vetting process, since I love/hate watching bratty teenage salespeople comb through my ill-thought-out sample sale purchases et al; I get slightly offended when they disdainfully decide my worn-out wedge heels and sparkly H&M shirts aren't good enough for their customers. But after I leave the store with a check in my hand and the knowledge that my floral dresses are going to someone who'll actually appreciate them, I don't give my old clothes much of a second thought. 1. Your clothes are judged. (By a less catty and almost certainly less well-paid group than at, say, Wasteland, which is my favorite place to sell clothes on the West Coast.) 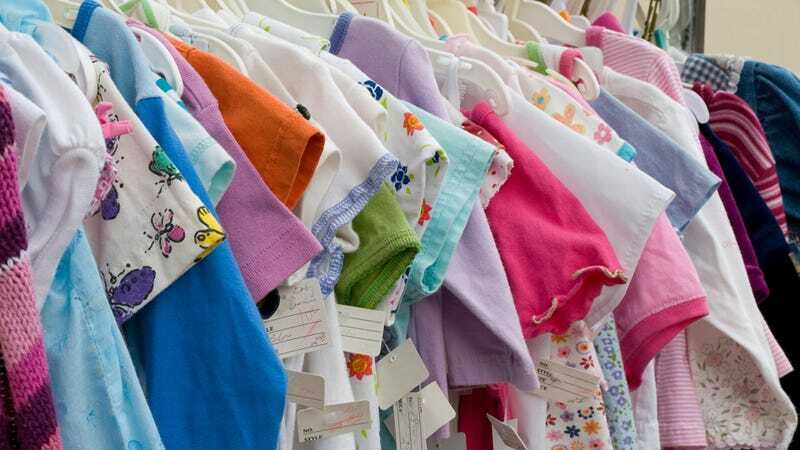 On the third floor of Brooklyn's Quincy Street Salvation Army, Cline saw "dozens of Hispanic women ... standing behind a row of wooden slides, pulling clothes out of elephantine gray bins and separating them into broad categories like jackets, pants, and childrenswear. " They ticket and price the best pieces based on condition and brand. (But you don't have to hear them giggling behind your back about your propensity for cheap halter tops.) It's a science: the sorters choose exactly 11,200 garments a day to be divided up equally between the eight thrift stores the distribution center serves. In the rag-cut room, two men were silently pushing T-shirts, dresses, and every other manner of apparel into a compressor that works like the back of a garbage truck, squeezing out neat cubes of rejected clothing that weigh a half ton each. The cubes were then lifted and moved via forklift to the middle of the room, where a wall of wrapped and bound half-ton bales towered. I saw tags for Old Navy, Sean Jean, and Diesel peeking out of the bales, as well as slivers of denim, knits in bright maroons and bold stripes, and the smooth sur­faces of Windbreakers. Smashed together like this, stripped of its sym­bolic meaning, stacked up like bulk dog food, I was reminded that clothing is ultimately fiber that comes from resources and results in horrifying volumes of waste. Clothing stores completely separate us from this reality, and a "rag-cut" room brings it home in an instant. 4. Africa. The processors shrink-wrap and send the best clothes to vendors around the world. Did you know that "Used clothing is now the United States' number one export by volume, with the overwhelming majority sent to ports in sub-Saharan Africa"? Now you do. And it's idealistic to assume that Africans want whatever we give them. "As incomes rise in Africa, tastes become more savvy, cheap Chinese imports of new clothes flood those countries, and our own high-quality clothing supply is depleted, it's foreseeable that the African solution to our overconsumption may come to an end," Cline writes. "What then?" What, indeed? Seems like cutting down on clothing consumption is the best — and the crucial — way to go. There's no such thing as a free lunch — or a guilt-free one-off Forever21 top.